Cricketer Virat Kohli and Bollywood actress Anuska Sharma may be ready to take their relationship to the next level. After dating each other for several years, reports suggest the two may be thinking of getting engaged. This after Virat's mother is believed to have met Anushka at her residence. An individual responsible for the management of Sri Lanka women's cricket team and two individuals responsible for selections are allegedly expecting sexual bribes from the players to retain and recruit them. MS Dhoni has opted out of the first three ODIs against Sri Lanka, citing the need for a break to freshen up ahead of the tour of Australia and the World Cup. Virat Kohli will stand in as captain, and Wriddhiman Saha, who scored a century in the IPL final earlier this year, will take care of wicketkeeping duties. Bhuvneshwar Kumar has been rested, making way for Varun Aaron. South African athlete Oscar Pistorius has been given five years in jail for killing his girlfriend Reeva Steenkamp. Senior players of the Sri Lanka cricket team are in seek of excuses to skip the sudden Indian tour, 'Sri Lanka Mirror' learns. The Sri Lanka Cricket (SLC) will gain an additional profit amounting to nearly US$ 8 million (Rs.1.04 billion) due to the sudden Indian tour, SLC Secretary Nishanta Ranatunga says. The President has requested a group of Sri Lanka Cricket (SLC) Executive Committee members to conduct an investigation into the SLC Secretary, Nishantha Ranatunga, suddenly agreeing to play an ODI tournament with India when the Sri Lakan cricket team was practicing according to a practice schedule set up targeting the future tournaments and the World Cup, reports say. Why is Dilshan at temple? Former Sri Lankan skipper Tillakaratne Dilshan celebrated his birthday on October 15. 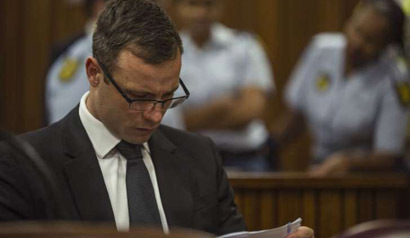 South African track star Oscar Pistorius should serve at least 10 years in prison for killing his girlfriend, Reeva Steenkamp, on Valentine's Day last year, the state prosecutor said at the close of the athlete's sentencing hearing on Friday. Sumith Perera has been re-elected as the President of the Kalutara District Cricket Association. Renowned cricketer Mahela Jayawardena has gotten a new grocery shopping partner.